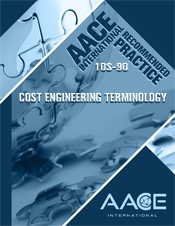 This document provides terms commonly used in all facets of cost engineering and in total cost management. Unless otherwise noted, all terms contained in this document have been developed by various AACE International technical subcommittees, special interest groups, or project teams. All terms have been subject to a thorough review process, followed by approval by the AACE International Technical Board.